This is a variation on the classic Roman dish except the Romans don't add garlic. 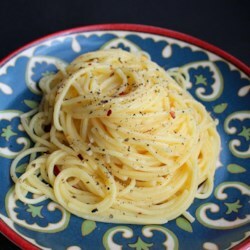 The name is cacio e pepe: cheese and pepper. The addition of garlic changes the dish but it is still tasty. This was a Friday night meal in our house growing up. It is meatless and inexpensive. Thanks for submitting your rendition.